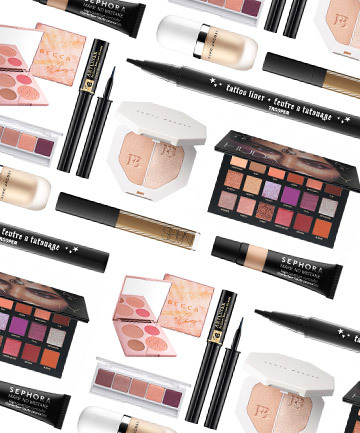 Use your hard-earned money wisely on the go-to makeup picks of industry pros. For makeup junkies like us, Sephora is basically our version of Candy Land. Whenever we step inside one, we can't help but walk down each and every row and throw eye shadow after blush after concealer in our shopping baskets. If you're anything like us, then you know that it's definitely easy to go overboard at the mother of all beauty stores. You walk in for a mascara, and you leave with lipsticks in a rainbow of colors, a contour palette you have no idea how to use, and a whole bunch of travel-sized goodies (even though you don't have a trip planned for months). Sounds familiar, right? While your makeup bag might be stuffed to the gills with gorgeously packaged beauty products, your bank account might be looking a little worse for wear. Which is why we went to the pros and had six of the beauty industry's top makeup artists share how they'd spend $100 on makeup at Sephora. Here, they reveal the lip glosses, eyeliners, and more they use on themselves as well as all day every day on clients. Trust us -- they know what they're talking about. Now go forth and shop Sephora wisely.